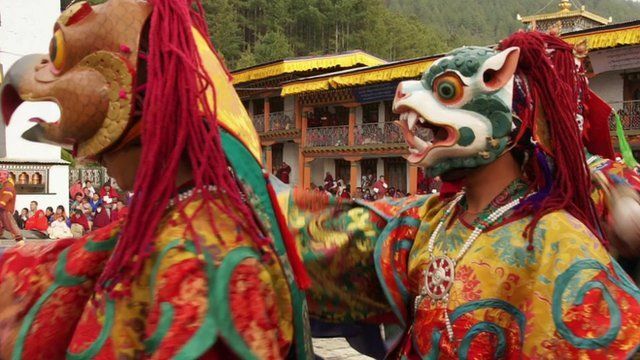 Bhutan's magical mask dances Jump to media player Bhutan is known for its mask dances which are an integral part of the country's remarkable cultural and religious traditions. 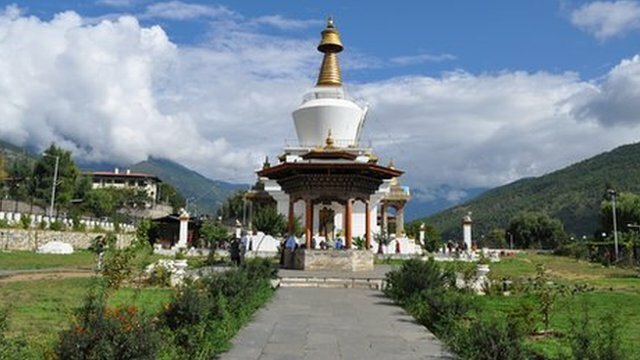 Bhutan ponders boom in tourism Jump to media player Tourism is on the rise in Bhutan, but ministers are unsure how many tourists they really want. Anbarasan Ethirajan reports. Joy in Bhutan as King Jigme weds Jump to media player Bhutan's King Jigme Khesar Namgyel Wangchuk has married his commoner bride in a lavish ceremony at a monastic fortress in the Himalayan nation. 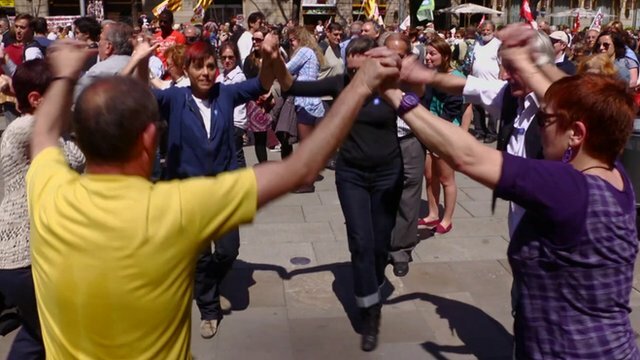 Barcelona's weekly circle dance Jump to media player What's got Barcelona dancing in circles? The small mountain kingdom of Bhutan is known for its mask dances which are an integral part of the country's remarkable cultural and religious traditions. The dancers wear wooden or papier mache masks that are colourfully painted and richly decorated. Performed by Buddhist monks and laymen, the dances take place annually in temples, monasteries and important administrative centres for up to five days. People believe that by watching these dances they can purify their souls and bring themselves good luck. Many Bhutanese are trained at a young age to carve these wooden masks. Anbarasan Ethirajan visited Thimphu to see the masks being made and learn more about the mesmerising dances.